WHAT CAN I DO TO HELP MAINTAIN MY SEPTIC SYSTEM? Restrict the use of in-sink garbage disposals. They add a large amount of organic and inorganic material to your sewage, which may exceed your system's capacity and cause it to fail. Systems are designed to handle domestic wastewater. DO NOT FLUSH things that DO NOT BREAK DOWN easily (facial tissue, large amounts of vegetable scrapings, coffee grounds, chemicals, paints, oils, sanitary napkins, applicators, condoms, medicines, pesticides, poisons, strong disinfectants, etc.) 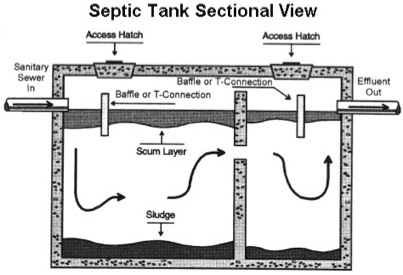 can damage a system or substantially increase the need for cleaning the septic tank. Make efforts to minimize the amount of water that goes into the onsite sewage system; typical water use is about 227 liters (50 gallons) per day for each person. Try not to exceed that amount. Having a water meter installed will help you monitor your water use. Do not pour grease or cooking oil down the drain (including toilet). Grease and oil is hard to break down. It will eventually move into the soil, plugging it off or block up your waste lines. Keep your fixtures in good repair. A slow-running toilet can add large amounts of water. A running toilet discharging ¼ gallon per minute will result in 360 gallons per day. This is more water than a sewage system for a 3-bedroom home is designed for. Make sure the access lids are structurally sound, secure and childproof. If access lids are buried, consider raising them above grade to facilitate access. If pumps are used in the system, have any pump screens cleaned (make sure they are re-installed) and have the control operations checked. Systems are installed near the surface - keep automobiles and heavy equipment off the system.